Why rely on standard energy management practices? Energy projects can bring significant energy cost reduction and massive non-energy benefits to business. We all know that. So, why bother with energy management, when it is projects that bring savings? Because implementation of standardized energy management based on best practices doubles the savings from projects. 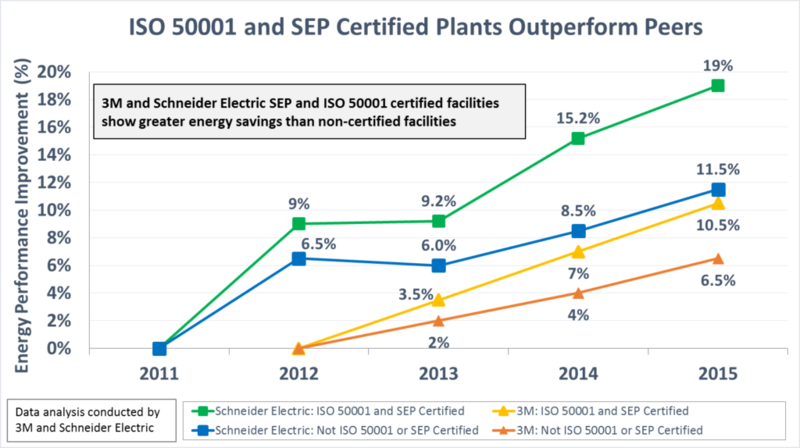 World leaders in the area of energy management – 3M Company and Schneider Electric – compared energy performance improvement of their plants certified under ISO 50001 and not certified. Certified plants on average achieved 62% higher savings compared to non-certified ones. Where does your company stand on energy management? Implementation of ISO 50001 has been proven to cut energy costs, however, implementation process costs a lot too. Luckily, mid-size plants do not have to jump through all the certification hoops to benefit from the best practices. To help you assess how does your company score against the best practices and how much more energy it can save by implementing them, we have developed an Energy Management Score™ Assessment. All questions are in plain English and answers are multiple choice. If you know how your plant deals with energy, it will take 15-20 min to find how much more your plant can save on energy and how much it can gain in business. 3M Canada scored 96% on EM Score™ and has reduced utility bills by 32% over 8 years. Not a coincidence. How much of your energy costs would you rather keep in your own pocket? Assessment has been proven to work in recent versions of popular browsers, starting from Chrome build 66 and IE 11. Other browsers may experience difficulties. EMS assessment uncovers core issues of energy management through a series of simple questions directly related to business. I particularly like how it links quality of practices with results. It’s a handy tool to start or rekindle an energy management conversation in the boardroom. The Energy Management Score assessment is simply-worded, engaging and thought-provoking. The questions compare current business practices to energy management best practices and provide the all-important gap analysis that fuels the drive for improvement. The assessment is simply worded, easier and faster to complete compared to energy management matrix that is used in some NRCan materials. I like how it is linked with Plan-Do-Check-Act model.